It is the beginning of tadpole season and if there are frogs in your neighbourhood you should starting to hear their raucous calling. Our critically endangered Archey’s frog maybe further endangered by the pet trade in frogs. The frogs you will be hearing though are all Aussies brought here in the latter half of the 19th century. The endemic Leiopelma species do not use calls to attract mates – but sadly these species are not quite as abundant as their introduced –cousins, so regardless you’d be hard stretched to find one. Habitat loss, introduced predators, pollution of freshwater streams and now the recent spread of Amphibian chytrid fungus have put NZ frogs in terrible danger. Worldwide frogs are in trouble and our native frogs are not excluded with all of them listed as endangered to some degree. 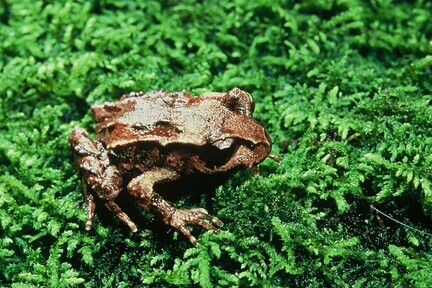 Fortunately, two of our native species are holed up on offshore islands in the Marlborough sounds (Maud island frog – Maud island) and (Hamilton’s frog – Steven’s island), so they haven’t been exposed to this fungus as yet. For the other two mainland species the outlook isn’t so rosy. The disease has spread throughout our critically endangered Archey’s frog population, and we’ve seen a severe decline as a result. And it is unclear whether our Hochstetter’s frog has the disease. My PHD looks at how frogs are moved around NZ and traded, how people are looking after their pet frogs and what pet owners know about frogs in NZ – to determine how this fungus is spread. In New Zealand, well over 10,000 tadpoles are traded each year and my initial research shows many of the traders are unaware of the virulence of the chyrtid fungus. It appears that good intentions may be contributing to frog decline. Well-meaning people buy frogs and tadpoles to repopulate areas previously abundant with frogs and this action helps to spread the disease. Further, people buy a frog without realising it is a long-term commitment – most frogs live till they are around 15 years old, and sometimes they’re released after their used-by date, so to speak . Unfortunately, people are largely unaware our wildlife act which states that “No person shall transfer live aquatic life or release live aquatic life into any freshwater” so it is actually illegal to release frogs and tadpoles. One problem that also contributes to the spread of this disease is the fact that it is largely invisible. Seemingly healthy tadpoles can be infected with it and only start to show symptoms as they go through metamorphosis. If you decide to keep tadpoles you should never dispose of any sick or dead animals into waterways or the environment. Signs of chytrid include sloughing of the skin, losing the righting reflex, lethargy and loss of appetite. However, to get a proper diagnosis you need to have a DNA test. Luckily for frog enthusiasts our introduced frogs are good travellers and can travel up to 10km in the breeding season. So if you are really keen to have amphibians in your garden, just create an inviting habitat and they’re likely to arrive under their own steam. Things to make sure you have in a frog friendly garden include a predator free environment, with plenty of foliage especially broad leaved plants like flaxes, a permanent water supply and lots of safe places to bask. Jenny Laycock has contributed 1 entries to our website, so far. View entries by Jenny Laycock. It is a huge shame that people never seem to think about researching before owning a pet. Especially an exotic one! If they did, like me, they’d know that it is illegal to release frogs into the wild.